“Invisible apps” are background programs that automatically trigger functions without being opened. Therefore, the app interface is less important than the underlying function. These invisible apps might include automatic notification or emails based on a trigger, a personal concierge, or a password manager. Rather than a calculator or camera app waiting to be opened, invisible apps actively interact with users. Why do Dennis Kennedy and Tom Mighell believe these to be the newest generation of device apps and how can a lawyer use them in his or her practice? 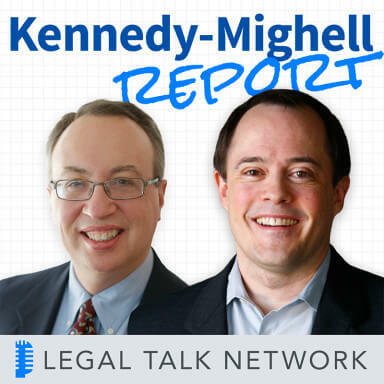 In this episode of The Kennedy-Mighell Report, Dennis Kennedy and Tom Mighell discuss invisible apps, how they might impact or benefit lawyers, and whether they are the leading edge of a much more significant technology wave. They discuss moving away from labeling app success only by presence on the home screen and how invisible apps are more often used but rarely opened. For example, Dennis uses his news apps for breaking stories, his password manager interacts with other apps, and he receives context notifications (e.g. within proximity to a Facebook friend). He also talks about Invisible Girlfriend, an app that gives social proof of a fake relationship for inquisitive friends and family. Tom discusses many useful apps for “if this, then that,” apps that arrange appointments, reservations, and groceries, and email notification automation for social updates. Tom and Dennis discuss how this new generation of notification apps is indicative of emerging information intake platforms like smart watches. Finally, they talk about how lawyers can use these invisible apps for personal life, professional organization, or even client communication. In the second part of the podcast, Dennis and Tom discuss Dave Winer’s new idea of a five minute podcast that quickly comments on one topic, answers a question, or responds to a post. They discuss the searchability of the podcast, the work spent on production, and whether this really is the Twitter of podcasting. As always, stay tuned for Parting Shots, that one tip, website, or observation you can use the second the podcast ends. Advertiser: Got the world turning as fast as it can? Hear how technology can help – legally speaking. With two of the top legal technology experts, authors, and lawyers: Dennis Kennedy and Tom Mighell. Welcome to the Kennedy-Mighell report, here on the Legal Talk Network. Dennis Kennedy: And welcome to episode 153 of the Kennedy-Mighell Report. I’m Dennis Kennedy in St. Louis. Tom Mighell: And I’m Tom Mighell in Dallas. Dennis Kennedy: In our last episode we reflected on the last ten years of blogging and law blogging’s feature. Tom mentioned recently that he was interested in something called invisible apps. As part of our ongoing effort to discuss new technologies before many people have even heard of them, we decided that we’d try to see what was happening with invisible apps. Tom, what’s on our agenda for this episode? Tom Mighell: Well, Dennis, in this edition of the Kennedy-Mighell Report, we’ll be talking about the idea of the invisible app, what it is, and why I think it might be interesting. In our second segment, we’ll discuss Dave Winer’s recent idea of the 5 minute podcast. And as usual, we’ll end with our parting shots, that one tip, website or observation you could start to use the second this podcast is over. But first, let’s talk about the notion of the invisible app. You may have heard the argument that for an app to be successful, it needs to earn a place on your home screen. David Sparks, also known as Mac Sparky, likes to feature the home screens of iPhone users to showcase the apps that are most important to them. The idea of the invisible app actually isn’t really new. It’s a couple of years old, although there are some new things that are being added to that concept and it argues that an app doesn’t have to be visible on any screen or there really doesn’t have to be an app at all to provide value. And I will agree, as we start out, that this is an esoteric topic. It’s one that I think it’s interesting and since Dennis usually gets to pick the topics, I decided it was time to talk about something different. I think this is probably an unfair question, Dennis, seeing as I forced this topic on you, but how would you try to explain the idea of the invisible app? Dennis Kennedy: I see it as the next generation of apps and there’s a couple of ideas that come together. And so I think the focus becomes less on what the tool is and maybe even what is exactly happening in the app, but more so on what the value and the use that it brings to the user and of course we’re going to have to give some examples of that. But I think that these are apps that typically are going to fall in the area of notification, I would call it, as some of the best examples. And I think the idea is, as you said, people are used to saying the most important apps are the ones that are on the homescreen. But there are apps that don’t really live on your homescreen and they may pop up with notifications or work together with other apps in a way that’s really seamless and you might not even have the sense that you’re going to the app itself to open it in order to get the value out of it. So it’s invisible, but it’s also helpful in a really interesting way. Tom Mighell: Yeah, and like I said before, I don’t really think that this is a new idea. When I was doing research for it, I found references to invisible apps 2 or 3 years ago. And maybe to think about it in a more basic way, if we think about the first wave of apps that came out as smartphones and tablets were designed, we would probably call those closer to being one purpose apps. So your phone can be a camera and then your phone can be a calculator and then your phone can be an instant messaging tool and there were apps for each one of those purposes. And then there was a period of time where the apps tried to pack every feature possible into it so that it could be your home base. So you could read the news and tweet to social media and do just about everything and they would pack every service that could be offered into a single app. And I think that the idea of the invisible app hits on that third wave. It’s been happening for a couple of years now but I’m seeing something even kind of new now that wasn’t happening a couple of years ago and I guess I would describe it best as the app as a service layer. And I think that as you started to mention, there’s really two kinds of apps that I think of as invisible, the ones that are those notification-driven apps. They’re collecting information on you and they only come up and they say things or give you information when it’s right for you to need them. For example, progress to your step goal to tell you how far along you’re going. Or what was interesting at ABA Techshow was I was sitting at my hotel room at Techshow, and all of a sudden my phone popped with a message from Facebook that said, “Your friend Kevin O’Keefe is in the area.” And later that day I saw Kevin and Kevin said hey, you know I got a message from Facebook that said you were in the area. And I thought of how odd it is that both of us were getting those messages. But that’s the kind of service layer that we’re talking about with the invisible app. The other one, though, what I think of as being a little bit newer and a little bit more interesting are apps that are coming out – maybe it’s better to say services that are coming out – that don’t even have an interface at all. So maybe it’d be better to call them services that use existing apps to serve a purpose and I think we’re going to talk about some of those examples here in a little bit. But they’re actually services that you receive text messages or emails or you use other tools on your smart device – whatever it happens to be – to get things accomplished. And I think that’s kind of an interesting concept that we probably haven’t spent a lot of time thinking about. Tom Mighell: Right, but the nice thing about those apps is that where they didn’t really exist in the past, for example, 1Password now – at least on my Android phone – whenever I open an app or whenever I open a website that calls for a password – and I take that back. I don’t use 1Password, I use the LastPass app. Whenever I open an app that requires a login, LastPass immediately opens up and says you’ve got a login here, do you want to sign in to your location. So it raids the context, it understands what I need and it tries to help at that point in time, which I think is very, very interesting and very helpful. I think you and I have talked on this podcast a number of times about IFTTT: if this, then, that. And I think that some people may have used either – I’m not sure if it’s called Zapier or Zappier, but it’s a similar service and I would place that into the same realm of apps without an interface because it’s a service layer. They provide a service by connecting two apps together to do certain things. And that’s what reminded me of when you talked about the internet of things; it makes things happen behind the scenes without you either having to do something or it’s kind of a set it and forget it kind of a thing. I guess I wanted to talk about some of the examples of some of these new apps that we’re seeing out there that don’t have an interface that use other tools. Most of them are using things like SMS text messages, voice messages, things like that. There’s a whole set of what I would call personal concierge apps that are designed to help really do whatever you want them to do. There’s an app called GoButler that uses text messages. You use GoButler to ask for some groceries, they’ll arrange for some groceries to be delivered. You can arrange travel bookings, you can ask them to book travel or book restaurant reservations for you. You can order food, you can make appointments with GoButler. I don’t know if it’s recommended by people but it’s all over the news in terms of what it can do. There are other services, one that’s called Clara and a companion side that looks like it’s called x.ai and they are designed to be your personal assistant when it comes to scheduling meetings. You just CC an email address for the service when you send out a message saying, “Hey, I’d like to meet on Friday at 2 o’clock,” and Clara will go do that. Clara will go and set up a meeting invite and check calendars and make sure that that gets taken care of. There are other services that do things that I think have been around for a long time; things that will automatically do something when it sees something happening like if this then that. There’s a site called Kidpost, which is designed for your less-than-techy friends on social media so that every time you post a picture to Instagram or you post something to Facebook or Twitter, it’ll automatically email your friends that you want to email so that they won’t get left out of your kid’s pictures or other things that you might post on social media. I think all of these are services that are working in the background that really provide a useful service and I haven’t really seen a lot of people using these types of services; I’m intrigued by them. I don’t know, Dennis, if you’re intrigued enough to try out any of them. Any other examples you want to talk about? Dennis Kennedy: I’m intrigued by the whole concept and also as it starts to get easier. So when I first started to think about this, I was thinking there’s this New York Times app that sits on my phone and I don’t know if I’ve ever really opened it. But I do know that when there’s breaking news, it pops up in alert for me. So it’s not the classic invisible app but I use it in an invisible app sort of way. So New York Times was measuring the use to me or what kind of user I was by how many times I opened the app. I would be a terrible user but it’s actually a valuable app to me. And so the measurement of usefulness of the app I think starts to change. I think there’s some really interesting things as you tie it to location; so you’re in a certain area, certain things are happening. Some of this is internet of things, ideas, so once you get close enough to your house in your car and your garage door opens, those sorts of things. So I think some of those starts to fall into that category. I guess the one that might be one to think about, because it does illustrate a number of things and it’s gotten some publicity and our friend Matt Homann is involved in this one is invisible girlfriend. I haven’t talked to Matt about this actually, for a while, but I’ve certainly defended him to people probably without him knowing that. But what I find interesting about that is when you kind of pull up a layer of abstraction. So anyway, the idea of invisible girlfriend, invisible boyfriend, is you set up this service and then you’re getting Facebook updates from your invisible girlfriend or boyfriend that are scheduled to come to you so you can fool your friends and family that you actually have a boyfriend or a girlfriend. So it’s not so much that specific idea, but if you pull back a level, what you have is sort of a wrapper around a platform that sends customized scheduled facebook updates. Tom Mighell: Or text messages or voicemail or things like that, it’s not just that. Dennis Kennedy: And so I think that is sort of the notion of the invisible app with this platform. So you don’t really care in a way that it’s text or it’s Facebook or you don’t even care about how the underlying technology works. What you’re saying is this gives me a certain benefit and it has a certain value and it happens automatically without me saying I need to go into this app and send a message to myself. That would be a total fail, I think; but to say here’s a service that’s sort of a wrap around something else happening. That, I think illustrates a couple of the key ideas I think about invisible app as I start to think about it. So I don’t know, Tom, if I’m on track with this or not, but that’s how I started to think about it. Tom Mighell: I think you are and I think it brings up a question that you and I have been discussing and that it may be a subject for a future podcast that we’re going to talk about is what the next platform is. We’ve talked about mobile platforms for a long time and we sort of think about what’s the next new platform. And believe it or not, I’ve been seeing in the news lots of different choices vying for that next new platform. But I think one that is kind of hitting the forefront right now is notifications, and are notifications the platform. Now a lot of these invisible apps aren’t necessarily notification tools, although to a certain extent they are. They’re notifying you that the service is working for you. So I suppose that invisible app, invisible girlfriend at its base, is notification that you have a fake girlfriend or boyfriend. And I just wonder if you’d think that – and I don’t want to get into a whole platform abstract discussion – but I sort of think that notifications really have become that new platform. Especially when we are considering the fact that how many millions of people have already bought an Apple watch whose primary goal is to notify you when something is happening on your iPhone. Dennis Kennedy: Yeah, and I think I was going to go to the same place. You think about Apple watch and you talk about customized notification, this sort of haptic interface. Again, I don’t have my Apple watch yet, but my friend who gave me a thorough demo of it really liked the fact that the watch sort of tapped you. And then I also know that a lot of people are interested in this customized vibration or tapping that you get to let you know an important notification. So you have that customized notion, you say I’m getting a zillion emails a day, all this other stuff coming at me. What I’d really like is something that will help me very quickly determine what’s important or not and then I can pay attention to it and the rest of the stuff I can ignore to a better time. So I think it’s not so much notifications itself, I think it’s the ability to customize and tailor notifications in a way that puts us in control, rather than what I think the past was with apps and things where people were saying, “Can I force people in my environment and make them live in one world and this will be their one app,” and I think it gives us the potential to have more control. And I also think as we think about platforms, I think that there’s a lot of things that this touches on and it illustrates notions like APIs and some of the other potential platform ideas that are out there; and lots of interesting potential. Like I said, to me, the location piece and other triggers become really interesting, so it is the internet of things, API, mobile. I think there are a number of different candidates for new platforms and I think you’re right, Tom, it’s probably going to be in an upcoming episode on this podcast. Tom Mighell: I’ll come back to your statement a minute ago by saying that it’s not just the notifications, it’s the ability to customize them. I’ll argue that just being the notification is pretty darn significant. We’ve talked on this podcast about how I’ve had an Android wearable watch for some time now, and I look less, I check my phone less because I get a little buzz. The little buzz tells me that something has happened that’s important because I’m only asking it to buzz me for the things that I really want to pay attention to and I can, within a second, look at that and decide whether that’s important enough that I need to pull my phone out, that I need to do something about it. And it really has affected the way that I work, the way that I conduct my business during the day and I think that really is important. Let’s wrap this session up by asking – I guess we’ve got to bring it around to lawyers at some point in time and say, do we see a legal use in this? Is there a way that lawyers might use invisible apps or are we mostly talking about a personal use, something that will help them personally more than anything else? Dennis Kennedy: Well I think it’s easiest to see the potential on personal matters. But when you focus on a notification piece, then I think lawyers are creative enough – especially the lawyers who listen to this podcast – to say there’s a platform that offers some potential for notifications then a lot of what I do as a lawyer, especially if I’m a litigator, involves some sense of notification. So I think that at this point, you leave it to the imagination of our lawyer listeners. And then also I give them the homework, which is to say, would it be possible for a lawyer or law firm to either offer or take advantage of some kind of invisible app that’s directed toward clients. Tom Mighell: And I think about that and I was ready to talk about that, but then I started to think of how some of these other services work and whether you’re providing automatic information. Then you have to worry about artificial intelligences that the unauthorized practice of law can that happen, if it’s that artificial body that’s either giving advice or giving communications, I think you have to limit whatever those notifications are. Just things that would not be construed as advice or would not be construed as something that could get the lawyer in trouble. But I do think it is very intriguing to see where – and I like the idea of giving our listeners a little bit of homework to see where lawyers might take something like this. Because they usually wind up surprising us with the kinds of things that people come up with for these types of ideas. Dennis Kennedy: So Tom, is your next book potentially invisible apps in one hour for lawyers? Tom Mighell: Yeah, I don’t think there’s probably a book in that subject but I do think it’s definitely worth looking at a lot of these services, whether it’s something that you want to try and gain some inspiration for a legal app or if you just want to use one of these personal concierges or try to find some way to help it run your life better. We’re going to post a ton of links to a bunch of these different sites in the show notes. So I think it’s worth taking a look and seeing of some of them might benefit you at some point in time. Before we move onto our next segment, let’s take a quick break for a message from our sponsor. Advertiser: Looking for a process server you can trust? Serve-Now.com is a nationwide network of local, prescreened process servers. Serve-Now works with the most professional process servers in the industry. Connecting your firm with process servers who embrace technology, have experience with high-volume serves and understand the litigation process and rules of properly effectuating service. Find a prescreened process server today. visit www.Serve-Now.com. We’re glad you’re listening to Legal Talk Network. Check us out on Twitter, Facebook and LinkedIn too. Tom Mighell: And now let’s get back to the Kennedy-Mighell Report. I’m Tom Mighell. Dennis Kennedy: And I’m Dennis Kennedy. I’m seeing more and more podcasts these days – or actually I’m hearing more and more podcasts these days – and not just a bunch of great new Legal Talk Network podcasts, which there are quite a few new ones. So Dave Winer who at ScriptingNews.com has his blog is definitely one of the inventors of blogging and podcasting both. So on his blog he recently proposed the idea of the 5 minute podcast, he called it. So the notion is essentially a short podcast with a few quick thoughts or response to a question that someone’s asked or a response to someone’s post that you don’t really have the time to write something about, but you could do a quick podcast that can be done really quickly and easily and maybe in a better way than if you try to write something. So you then release the short recording as a podcast. He’s recorded a few of these already. Tom, you’d be interested, most of his 5 minute podcasts have gone over 5 minutes. Tom Mighell: I’m shocked, I’m shocked at that. Dennis Kennedy: Not that we’ve ever had that problem. So Tom, what do you think about the 5 minute podcast idea? Tom Mighell: This is actually a follow up in a way to what we talked about in our last podcast that maybe it’s easier and more effective to post a 5 minute podcast to express a thought or to answer a question than to write a blog post on it. Maybe it makes more sense, we’re busy. And frankly, with the idea with the 5 minute broadcast, it’s something you could probably do on your phone. It’s something you could do using a basic recording tool. You don’t have to sit up with a big fancy microphone using big fancy recording stuff. You could just record something very quick and post it as a podcast with very little effort. I think the 5 minute length is generally pretty good. National Public Radio makes a ton of them and you call them podcasts because you can download them and listen to them on a mobile device at your leisure. But really what they do is they just take their new stories that they put together into a two hour block of stories and they break them into 5-7 minute chunks. And I think that makes a lot of sense, it gets across a small but important amount of information in a short period of time. I guess the one downside to doing a 5 minute podcast versus writing a blog post or other posts to social media or somehow memorializing it on the web in some other way, is that your spoken words are not searchable. If you answer a question or provide some other valuable information, only the people who listen to your podcast are going to be able to get it. By contrast, if you blog about it, people who might have that question or who want to benefit from whatever wisdom you’re imparting in whatever it is you’re talking about, will at least be able to search to find your written words. And so that would be my only – if you’re recording a 5 minute podcast just because you don’t have time to write something or you’re too lazy to write something or you just don’t want to do it, that would be, for me, you have to be counting on a large audience to listen to that stuff because otherwise not many people are going to hear it. Tom Mighell: It sort of defeats the purpose. Dennis Kennedy: Yeah, it defeats the purpose of the shorter podcasts. So anyway, those are my thoughts, but I love experiments like this. Tom, fortunately we haven’t gone this far, but I just see more and more hour and a half or two hour podcasts. And people might think of doing multipart podcasts when they go that long, but when you see in your list of podcasts to listen to 2 hour podcasts, you start to long for people doing 5 minute podcasts. Tom Mighell: It’s true and I look forward to – if you think it’s a good experiment, I can’t wait to hear your first 5 minute podcast. I imagine that we will not be trying that here on the Kennedy-Mighell Report. Dennis Kennedy: So now it’s time for our parting shots, that one tip website or observation you can use the second this podcast ends. Tom. Tom Mighell: So in a recent podcast, I think our Techshow podcast, Dennis was mentioned one of the tools that we really like is an upcoming tool called Legaler, which he described as a Slack for lawyers. But we haven’t really talked about Slack so I’m going to use that as my parting shot because I’ve really been experimenting with it and being interested in using it without having the right outlet to use it in. Slack is a new way of communicating in the workplace. It’s primarily – if you look at it – it looks like it’s designed for a software company or startup company that has a certain way of communicating. And what it does is it has an app that’s available on all platforms so you can get it on Mac or Windows or Android or iOS and it is email and file sharing and instant messaging and all of that rolled into one. It’s designed to be a self-contained place where everybody can talk. And so the general idea of it is that you set up channels depending on the types of things that you want to talk about and on each channel, people can send messages to each other. I know the ABA Techshow board and staff used Slack as their communication tool and they gave up using email entirely at some point because it was a lot more convenient to use Slack. You can link to Dropbox files within there and you’re not actually storing the Dropbox files within the Slack app, they’re still just on the Dropbox. But anybody can go download it that it’s been shared from somebody’s Dropbox account. I think it’s a really intriguing way of changing the way that people communicate at work. I’m trying to find a way to integrate it into my company and to the way that we do it, we’re small enough where we could. I’m just going to be interested to see if people who are used to a life of working with email can actually get behind a new way of communicating that is interesting and fresh and maybe actually more efficient. It’s called Slack, Slack.com. Dennis Kennedy: Dan Bricklin was one of the creators of VisiCalc, though it’s known as the first killed software app. And he’s been involved in development for a really long time, he’s done apps and he has a podcast called Adventures in Alpha Land. Episode 15 is a discussion with Ben Bajarin on developing for the Apple watch and it’s fascinating because it’s two developers thinking aloud about how they might develop apps for the Apple watch. And what’s interesting is they really go down to the fundamentals of what you would want to do with a watch. And I think it’s less than a half an hour but it’s a great podcast to listen to and they talk about two things about the watch that really got me thinking and that they were kept in mind as they were trying to decide what apps to develop. And so one is called the glance. So what would people want to do that all it takes is a glance at a watch to get the information or to accomplish what you want. And the other is the custom notification notion. So what types of notification would i want to come to a device that gave me enough information that I didn’t have to pull a phone out of my pocket. So it’s a great way to think of wearables and how things are developed and really, in a lot of ways, where technology is taking us. Tom Mighell: So that wraps it up for this edition of the Kennedy-Mighell Report. Thanks for joining us on the podcast; information on how to get in touch with us, as well as links to all the topics we discussed today, is available on our show notes blog at TKMReport.com. If you like what you hear, please subscribe to our podcast in iTunes or on the Legal Talk Network site where you can find archives to all of our previous podcasts. If you’d like to get in touch with us, please email us at [email protected] or send us a tweet. I’m @TomMighell and Dennis is @DennisKennedy. So until the next podcast, I am Tom Mighell. Dennis Kennedy: And I’m Dennis Kennedy and you’ve been listening to the Kennedy-Mighell Report, a podcast on legal technology with an internet focus. Help us out by telling a couple of your friends and colleagues about this podcast. Advertiser: Thanks for listening to the Kennedy-Mighell Report. Check out Dennis and Tom’s book, The Lawyer’s Guide to Collaboration Tools and Technologies: Smart Ways to Work Together. From ABA Books or Amazon. And join us every other week for another edition of the Kennedy-Mighell Report, only on the Legal Talk Network.